1. Tap the spoon and fork icon to feed him. Tapping this icon will take him to his cute little wooden dining table. Now press the big green plus icon to add a food item. You can show your love by buying a pricey dish, but that’s not necessary as it does not provide any kind of bonuses. However, it will fill Hank’s level bar faster. You can just buy some carrots, apple, bananas or French fries for him and save coins/diamonds to buy expensive food items for animals at the beach. 2. To take your pup out to pee or poo, tap the commode icon. To make him sleep, press the third icon and then tap the sun in the background. When the toilet icon is 25 percent empty, Hank will pee when you take him to toilet. When it’s 100 percent empty he will take a dump. 3. Check the background color of all three icons (Food, Toilet and Sleep). If they are all green, then you don’t have to do anything. Once they turn orange, you can start fulfilling his needs to fill them up. Filling up the Food, Toilet and Sleep icons also fills the level bar. Hank’s behavior also reveals what he wants to do. 4. Check Hank’s actions before feeding him or taking him out to pee. If Hank wants to pee, he will close his eyes and press his tummy with both hands. You cannot feed him when he wants to pee, even though the food meter is empty. You will first have to take him to the toilet and then you can feed him. Similarly if his behavior suggests he is hungry, then give him some food and then take him out to poo. 5. Of all three icons, the sleep icon takes a long time to fill up. It may take 30-60 minutes or the sleep gauge to be 100 percent full. Your pup’s level meter fills little by little automatically as the sleep icon’s bar fills up. Food and Toilet icons fill up quickly and you can even feed your pup or take him out to pee when they are 50 percent empty. 7. When your pet pup’s sleeping, you cannot go out to take pics of animals. Tapping the island icon (coconut trees) at the lower right corner of the screen will wake him up and the sleep bar will stop filling. 8. When your pup is tired, you cannot take photographs of animals. He needs a good night’s sleep before he can start capturing pics. You can either put him to sleep or spend 5 diamonds on an energy potion to instantly rejuvenate him. My Talking Hank’s “animal” mode is somewhat similar to Neko Atsume, but instead of kitties, you will be attracting a variety of animals and birds, including pre-historic creatures and animals in quirky costumes. To attract animals, you will have to place food on the empty bowl and toys on empty spots shown by arrows. When you put food on the bowl, a timer appears on the top of the screen. A new animal appears when the timer hits zero. The first animal will arrive pretty soon. However, it will take several minutes before the next animal or bird appears on the playground. You can spend 50 diamonds to attract animals instantly, but that would not be a wise choice. You should save diamonds for special food items, which will attract rare creatures. Don’t put the same old boring food on the bowl every time. Try placing new and delicious foods to attract a wide variety of animals. For example: Carrots will attract bunnies. Diamond foods, i.e., those foods that can be bought with diamonds attract rare and epic creatures. Placing new toys also attracts new creatures. Purchase new toys and place them in different spots to attract various animals. When creatures arrive, they will start playing with toys. You will have to tap each playful creature and Hank will take photos of them. Creature photos will be stored in your virtual album. Animals leave coins or diamonds after they visit. Try attracting rare animals to see if they give more coins or diamonds. Taking pics of animals will also give players coins and diamonds and unlock new costumes for Hank. Taking a photo of the same animal with different toys fills the photo bar. You will get coins/diamonds or unlock new costumes once the bar fills up to a certain mark. You will get two rewards of which the first one can be earned pretty quickly. The second reward will be unlocked by taking more pics of the same animal with different toys. Most animals unlock rewards (and a trophy) when you take their photos with 30 different toys. 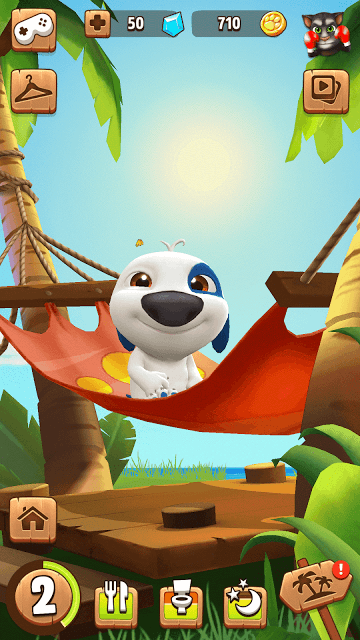 However, there are some animals (Example: White Bunny) that need to be photographed with only 15 different toys to unlock rewards. Such animals usually unlock costumes for Hank. You can check each animals reward requirements by tapping the photo album at the lower left corner of the animals screen. Taking pics of animals with different toys is one way to fill the rewards bar and earn coins/diamonds. Another way is to watch 30 second videos. Tapping the cracked coconut will let you watch a 30-second video. After watching it, you will have to spin the rewards wheel to get rewards. If the arrow hits “Jackpot”, you will get 10000 coins, else you may get anywhere between 1-50 diamonds and 15-200 coins. A split opened coconut may contain more than one video, so keep watching videos to get rewards until the “Watch and Win” window and the coconut disappears. The coconut appears soon after Hank levels up. But it may also appear some other time, more so when you put him to sleep. The coconut does not disappear and stays for some time in case you want to watch videos later. On Hank’s home screen, tap the level icon at the lower left corner of the screen. This will reveal a new window that lets you change his name and access “Settings”. It also shows how big Hank currently is. Tap the “Settings” button and turn off “Sounds”. That’s It. Hank will try to listen but won’t be able to repeat everything. Can you tell me why some toys have a glow around them now I am in the higher levels (70)? Many thanks.